I found City was one of the few universities in the UK that offered a health economics course that's designed primarily for non-economists, like me. Amira El-Houderi was a delegate at the World Cancer Congress 2016, where the French President President François Hollande, Her Majesty Queen Letitzia of Spain and Michel Sidibé UNAIDS Executive Director delivered an opening speech emphasising on the need for stronger international collaboration and action to fight cancer worldwide. 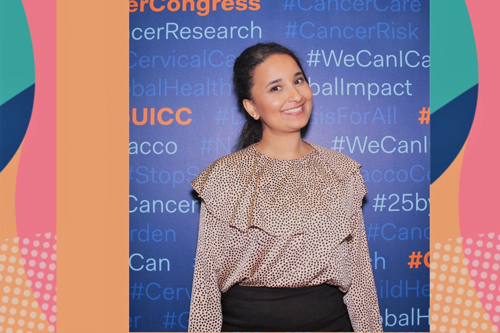 At the congress, Amira delivered an oral presentation entitled cost utility analysis of HPV vaccination for cervical cancer prevention in Morocco. In addition to this, she had insightful discussions with Sir George Alleyne, United Nations Secretary-General's Special Envoy for HIV/AIDS in the Caribbean region 2003-2010, on various topics including leadership in healthcare. She also congratulated Her Royal Highness Princess Dina Mired for being elected as president of Union International for Cancer Control (UICC) 2018-2020. I am currently working at a London-based consultancy firm as research analyst in health economics. During my short period of joining the Strategic Market Access team, I have been involved in a variety of evidence synthesis projects that aim to answer specific questions on a particular research area including economic burden of disease, by identifying relevant published studies, collecting and analysing data, in which these findings are used to populate cost-effectiveness models or to support health technology assessment submissions of our clients. What I enjoy most about this work is the process of learning about the necessity of ‘evidence’ in informing decisions, regardless of different contexts whether it be private or public sector. Also, being involved in both evidence synthesis and pricing research projects gave me the opportunity to communicate effectively and experience working with clients from the global pharmaceutical industry. Since a young age, I was always interested in politics and the decision making process, regardless of whether it involves healthcare or public affairs. After graduating from the London School of Hygiene and Tropical Medicine in 2011, I was uncertain about my future career particularly that I held a degree in molecular biology, which meant that I was most likely to become a laboratory researcher. Although I enjoyed molecular biology I could not see myself doing lab work the rest of my life. The year of 2014 was the turning point in my career. I was really inspired by a conversation I had with Dr. Mendy Dzingina, a health economist at King’s College. I was interested in learning about his career transition from a medical doctor to become a health economist. We had insightful discussions about evidence-based decision-making, his past working experience at the National Institute for Health and Care Excellence; and politics surrounding healthcare policies particularly in developing countries. I am very grateful to Dr. Dzingina as he strongly encouraged me to obtain a degree in health economics. He believed that I would do well, especially with my mixed background in molecular biology and interest in decision-making processes. In 2015, I joined the Eastern Mediterranean Regional office of the World Health Organisation (WHO EMRO) as a health economist intern. Given the gap between the need for introducing Human Papillomavirus (HPV) vaccine into the national immunisation programme of low-and middle- income countries to protect women from cervical cancer and the lack of cost effectiveness studies in the Eastern Mediterranean region, I spent more than three months at the Health Economics and Finance Unit working on my economic evaluation project. This project was also my Masters Dissertation project. This was a very self-rewarding experience as it made me rethink of my areas of interest particularly in relation to cost effectiveness analysis to aid decision-making, using health technology assessment for universal health coverage and health systems financing in developing countries. During my application process, I found that City was one of the very few universities in the UK that offered a health economics course that is designed primarily for non-economists and those with a life science background like me. I believe that I made the right choice. The course content and structure was great. Although I found some of the modules challenging, City has equipped me with good technical knowledge and transferable skills that I strongly needed when working at a leading United Nations agency for global health. Studying at City, enabled me to gain more than just a qualification. It allowed me to produce a good quality project which has successfully shed light on a ‘taboo’ topic surrounding sexually transmitted diseases and women’s health in North Africa and the Middle East. As a result my scientific abstract has been accepted for oral presentation by various international conferences including the European Health Economics Association, African Health Economics and Policy Association and the World Cancer Congress. Having said that, my decision to choose to study at City was also influenced by my brother’s great experience during his masters at City Cass Business School. I enjoyed lectures delivered by visiting professors from healthcare think-tanks and other institutes. I also enjoyed the economic evaluation practical workshops because it enabled me to develop skills in cost effectiveness modelling. The health economics and welfare economics were my favourite modules in the second term. It deepened my understanding on resource allocation and health insurance, which I found particularly relevant in the context of both my internship at WHO EMRO as well as in relation to the United Nations Sustainable Development Goals on achieving Universal Health Coverage by 2030. To come from a biology background and study health economics was a challenge in itself. My favourite part of being a City Student was building a good relation with my project supervisor. I am grateful to the incredible support I received from my lecturers. I am also very pleased that my World Cancer Congress 2016 research presentation is counted among City Health Economics Centre research associates. There are times when you can be questioning and perhaps doubting your skills in doing well in the course. You may struggle with statistics or understanding some basic economics. Do not worry, I did too. My advice to fellow City students is to challenge your doubts and never give up. Follow you passion, build good relationships with your lecturers and be prepared to grab opportunities, no matter how small these opportunities are, as they can lead you to a bigger successes. Finally, be nice to people and surround yourself with supportive friends and family.